Argos, the UK store chain, is running “Just Can’t Wait For Christmas”, a Christmas advertising campaign connecting mountain-side snow sports with the fast delivery offered over the next month. Filmed in Valle Nevado in Chile, the commercial shows world-class Canadian snowboarder Justin Lamoureux leaping from a 10-metre ledge holding a red flare. 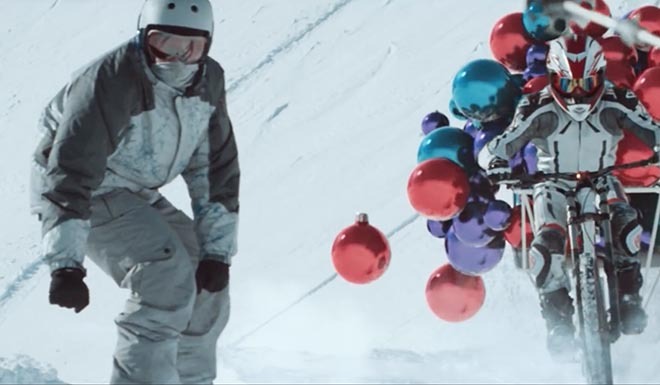 The film then follows a cast of 50 professional skiers and snowboarders as they rush down the mountainside – led by Lamoureux and surrounded by snow-mobiles, snow-buggies, zorbs, and even an Elsa bed from Disney’s Frozen, filled with Argos’ top Christmas gifts, including Beats headphones, Minions, Xboxes, TVs, wearable tech and toys. Hovering overhead, wing-suited Star Wars-masked stuntmen complete the action. The campaign highlights top brands available at Argos this Christmas such as Samsung, Fitbit, Nespresso and Xbox, alongside Argos’ new Fast Track Collection and Same-Day Delivery services. The film was shot using a combination of GoPro, drone and hand-held cameras. Some of the 100-strong crew were also on skis, allowing them to get right into the heart of the action. The TV ad will be supported by a broader Christmas campaign built on the creative concept of ‘Just Can’t Wait for Christmas’. The campaign will extend across digital and non-digital channels. Media was handled at MindShare by planners Mark Baschnonga and Laura Flewitt. Social media was handled at AllTogetherNow. Digital display is by Summit. Editor was James Rosen at Final Cut with assistant editor James Stubbs. Post production was done at Electric Theatre Collective by producer Serena Noorani, production assist Libby Behrens, lead Flame artist Yourick van Impe, shoot supervisor Giles Cheetham, 2D assist team Andrew Stewart, Matt Jackson, Ally Burnett, Chris Fraser, Sherin Mahboob, Pat Wong, Alex Prod’homme, Alex Grey, Bernardo Varela, Garrett Honn, Tane Welham, Taran Spear, DMP David Gibbons, CG lead Remi Dessinges, CG team Julien Soulage, Hendrik Freuer, Remi Gamiette, Rimelle Khayat, Deniz Cinar, Nile Hylton, Anthony Arnoux, Alan Cocksedge, Luping Shi, Tony Atherton, Fatih Dogan, Francesco Pelosi, Milen Piskuliyski, Joao Pires, Karen Halliwell, Laury Guitrand, Sean Elliott, Mak Knighton, and colourist Lewis Crossfield. Sound was produced at 750mph by sound engineer Sam Ashwell. Music, “Troika”, is by Sergei Prokofiev. Voiceover is by Miqutia Oliver.